HP Umpire John Hirschbeck ejected Twins RF Miguel Sano for arguing a strike three call in the top of the 7th inning of the Twins-Royals game. With two out and none on, Sano took a 1-2 fastball from Royals pitcher Luke Hochevar for a called third strike. Replays indicate the pitch was located off the outer edge of home plate and thigh high (px 1.187*, pz 2.055), the call was incorrect. 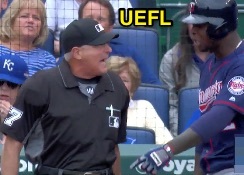 At the time of the ejection, the Twins were leading, 3-1. The Royals ultimately won the contest, 4-3, in 10 innings. This is John Hirschbeck (17)'s first ejection of the 2016 MLB regular season. John Hirschbeck now has -2 points in the UEFL Standings (0 Previous + 2 MLB - 4 Incorrect = -2). Crew Chief John Hirschbeck now has 0 points in Crew Division (0 Previous + 0 Incorrect Call = 0). *Px would have to had been less than |.916| in order for the pitch to have been a strike. This is the fourth ejection of the 2016 MLB regular season. This is the 2nd player ejection of 2016. Prior to ejection, Sano was 1-4 in the contest (3 SO). This is the Twins' 1st ejection of 2016, T-1st in the AL Central (DET, MIN 1; CLE, CWS, KC 0). This is Miguel Sano's first career MLB ejection. This is John Hirschbeck's first ejection since October 19, 2015 (Troy Tulowitzki; QOC = Y [B/S]).